Generally I try to plan my meals ahead for the week. As a family we have such a busy schedule, but then again who doesn’t these days. This means it’s even more important to make sure we are feeding our bodies with the right fuel to keep us going. Being a mother of two boys who are rapidly growing, I’m learning that they are ALWAYS hungry! What I feed them really needs to count otherwise they’ll be back in the fridge looking for more food! I try to give my children some freedom so they both get to choose one meal for the week. It makes them feel like they have a voice and they love that. My son was adamant that he wanted a takeaway curry! 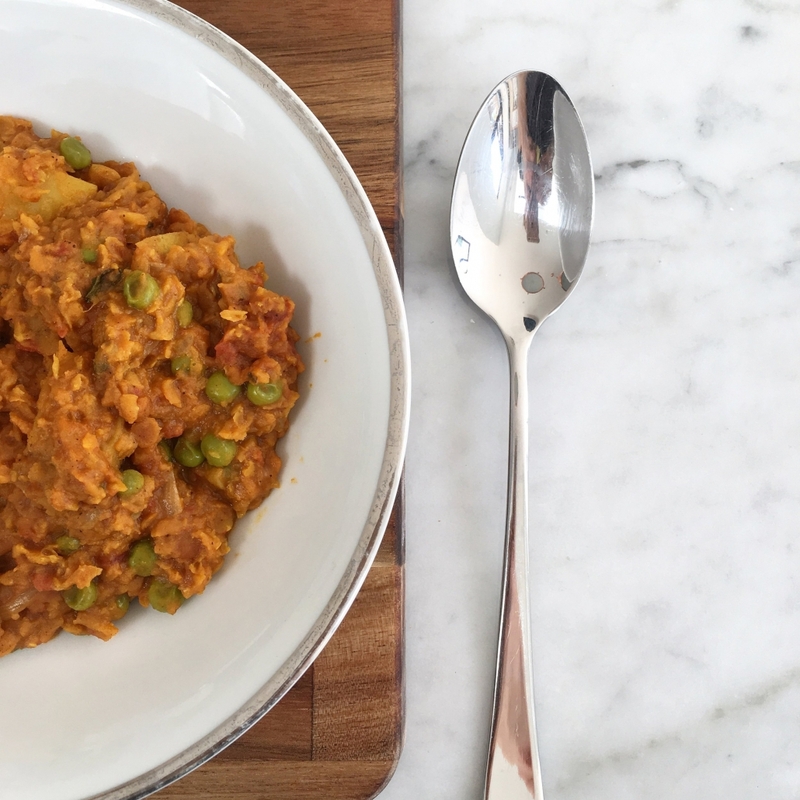 I don’t give them that much choice and with a little compromising we decided on a lentil, pea and potato curry which I like to call a vegetable dahl. It was a real hit!! Heat the oil in a large saucepan over a medium heat and cook the onions for 10 minutes. Add the garlic, ginger, ground coriander, cumin, turmeric and chilli and cook, stirring for 1 minute. Add the potato and lentils and stir coating everything in the spice mixture. Add the tomatoes, coconut milk, stock, garam masala, salt, bring to a boil and cover with a lid. Reduce the heat and simmer covered for 20 minutes, stirring occasionally. Add the peas and simmer uncovered for 5 minutes. Remove from the heat and stir in the chopped coriander and lemon juice. Serve with warmed wholemeal flatbreads or naan bread.